Today’s guest writer is Robbi Hess from DOGTV. Robbi is writing about how an enriched environment can prevent your dog from running away from home and getting lost. “My dog would never run away,” this is a phrase almost every pet parent says, and truly believes… until it happens. If you’ve ever lost a dog, you know the paralyzing fear it causes. You don’t know if she’s been hit by a car, stolen or so terrified by the ordeal she might not even respond if you call her. You’re terrified. Your dog is terrified. Frankly, it’s a nightmare no pet parent ever wants to live through. 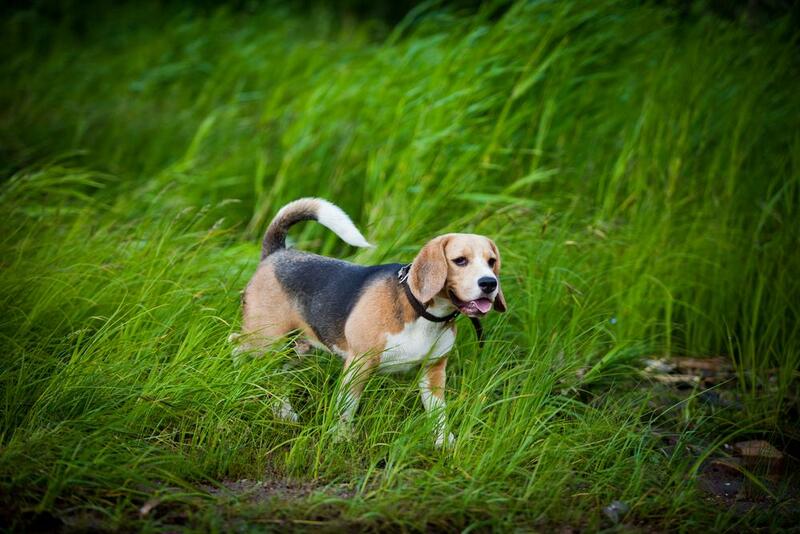 How can you prevent your dog from becoming a lost dog? Keep them away from open doors. Make certain they are wearing a collar that fits and that the collar has identification tags. Keeping them on a leash when you’re walking them. Checking the fence in the yard for any areas from which your dog could escape. Keep them away from open doors. Train your dog that it’s not okay to rush to the door when you get home. He should be trained to sit away from the door until you come in and give a command that will bring him running into your arms. Keeping a dog away from an open door is one of the best ways to assure he doesn’t get loose. This is especially true when you have guests coming in and out of the house. Any time you host a get together and have people in and out of your home, it’s an opportunity for your pet to bolt and to become lost. If guests aren’t accustomed to pets they may not understand how important it is to keep your dog in the house. Your dog’s training could keep him safe. Wear a collar, with ID tags, that fits. Many pet parents either don’t have their pets wear a collar in the house (probably because of the jingling tags!) or they don’t check that the collar fits snugly enough that their dog can’t slip out of it. It is definitely easier on your dog’s neck to have him wear a harness when you’re walking him, but get in the habit of having him wear a collar in the house. The collar should have a tag, like a PetHub ID tag, with your contact information on it in case he gets loose. Look at your favorite pet store for tag covers that can eliminate the jingling sound. Keep your dog leashed. When you’re taking your dog for a walk keep her on a leash. Yes, she may want to explore, but along with exploration comes the potential for her to chase a scent or be spooked by a sound or another dog or people and runoff. Your dog can safely explore and get a good workout when she’s on a leash. If you’re taking a walk in the woods and you want to let her roam, put her on an eight or twelve-foot leash to give her room to roam. When you’re walking on a sidewalk, choose a shorter leash. Inspect fences. A fenced in yard is a gift for any dog who loves to run. You can open the door, let him loose and watch him race around the backyard. When you do this, we urge you to not leave him unattended. You also need to inspect the fence regularly. Your dog may be digging and cause a breach in the fence or something could be digging from the outside to get in. A broken slat or other damage could provide an opening from which he could escape. NOTE: Keep your dog’s collar on even when he is running around a fenced area. An enriched canine environment. Your dog may not “know how good she has it,” but a dog who is happy at home may feel less of a need to dash when she sees an open door. How can you enrich your dog’s home environment? Give her plenty of exercise. A tired dog is a happy dog. If you have to work and your dog is home alone all day, take her for a long walk or a run in the morning so she can spend the day resting and relaxing until you come home. Give her belly rubs, scratches and love. The bond you build with your dog is the greatest deterrent, we believe, in keeping her happy at home. Make her feel safe. If she is afraid of loud noises like thunderstorms offer her comfort, love and a quiet room in which to escape the loud noises. Turn on a fan for white noise. Turn on DOGTV and its scientifically-developed programming to help calm and entertain her. Give him a room to call his own. Many dogs love their crates because it is their “safe place.” Whether your dog is in a crate while you’re away or whether the crate is where he goes to rest and relax when you’re home, teach him that the crate is where he should go when he’s afraid or anxious. Put his crate in an area he can always easily get to and if he’s in there, turn on DOGTV so he can listen to its soothing sounds and watch the images on the screen that can help lessen his anxiety. Offer toys to keep his brain engaged. Give your dog a variety of toys -- chew toys, squeaky toys, bones, stuffed toys and food puzzles. For a food-motivated dog, a food puzzle will keep his brain engaged and will provide treats while you’re away from home. Enriching his environment and his life means keeping him happily engaged so he doesn’t chew your shoes or bark all day while he’s home alone. If, no matter your best intentions, your dog escapes how can you get him back? If he is microchipped you may have a better chance at being reunited. Having taught him to “come” on command may bring him back to you. Take to social media to let anyone and everyone know your dog has gone missing. This step means you need to be diligent in taking photos of your pet and you and your pet together; post the most recent photos you have. Checking with the local animal shelters and rescues to see if your dog has been surrendered there. Check frequently with the shelters. Walk the neighborhood and calling her name. Call local veterinarians to see if any of they have heard about a dog being found. Put ads in local papers with a photo of your pet. Being vigilant and training your pup to stay away from open doors will help keep him happy and safe at home! If your dog is anxious, stressed or suffering separation anxiety, sign up for a free fourteen day trial of DOGTV to help him be calmer and more relaxed while you’re away. Enrich your dog’s environment to help relieve his stress. 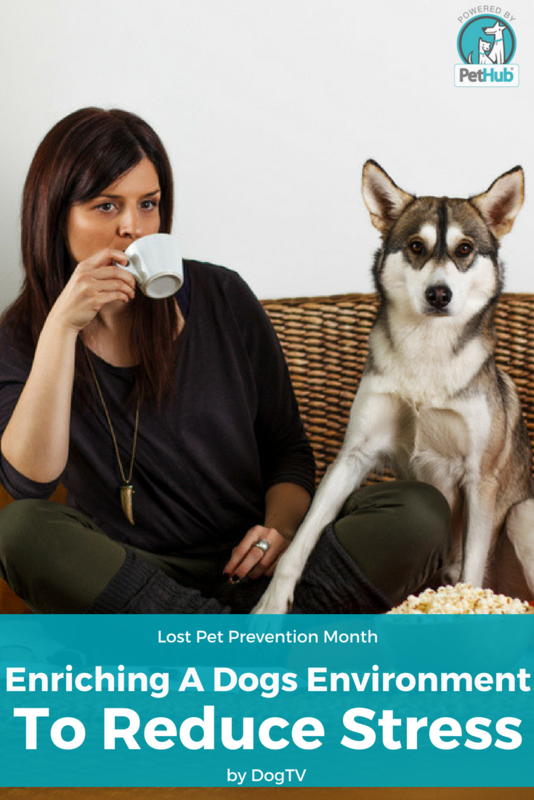 DOGTV is happy to have partnered with PetHub for its Lost Pet Awareness Month campaign.